Want to live green? Casey Trees Deputy Director Mike Galvin plans on telling you how to do it easily and within your budget. 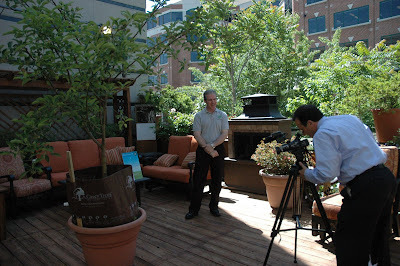 WUSA 9 invited Casey Trees to film a week of Green Tip of the Day segments with meteorologist Howard Bernstein. In one short hour, Mike became a star and five great tips were captured for future air dates. Don't worry - we will be sure to share with you when each tip will air and if you miss the airings they will be posted on both the WUSA 9 and Casey Trees websites. Hey, I saw this on Channel 9 this morning! Awesome! Great tips too! Thanks for letting us know you saw the Green Tip of the Day on WUSA9 this morning. Today's tip will be back on again this afternoon at 5:00 p.m. and Mike Galvin will be on three other days this week with new "green" tips for everyone.